The Arizona Geological Survey just released a new geologic map (65Mb) and 18-page report (9Mb) on Petrified Forest National Park in Arizona (located 25 miles east of Holbrook). Both can be downloaded for free here. Printed copies can be purchased from the Arizona Experience Store, 416 W. Congress, Tucson, AZ 85701; e-mail – store.azgs.az.gov, ph. 520.770.3500. The Upper-Triassic age (ca. 225 million years old) Chinle formation on the Colorado Plateau hosts the petrified wood and represents deposits of river systems originating in what is now western Texas and fed by tributary streams from highlands to the south and north of National Park. The Chinle Formation preserves a suite of lowland terrestrial environments that includes river channels, floodplains, swamps, and small lakes operating in a strongly seasonal subtropical climate. The rocks show that with time, the climate became arid. Within the National Park, the Chinle formation contains fossils of petrified wood, boney fish, sharks, locally abundant bivalves, gastropods, freshwater crustaceans and trace fossils of a wide variety of insects and other small arthropods. The well-illustrated report shows the geologic history of the area through a series of cross-sections. That history includes the existence of an extensive lake which persisted for about 12 million years. The report also contains many photographs. After the trees were transported downstream and became trapped in shallow waters, fluvial deposits of silt, mud, and volcanic ash from volcanoes to the south or west buried the logs and cut off the supply of oxygen; decay was thus retarded. Ground water percolating through the sediments dissolved silica from the volcanic ash. As the silica filtered through the logs, it precipitated from solution as microscopic quartz crystals in the woody tissues where air, water, and sap were originally present in the living tree. In some logs, cell structure remained intact, albeit entombed. Where the logs were hollow, woody tissue did not limit crystal growth; large crystals of rose quartz, smoky quartz, amethyst, and other gemstones or large masses of amorphous (noncrystalline) chalcedony and chert lined the cavity walls. Originally, researchers believed that minerals replaced the wood fibers. In recent experiments, however, after acid was used to dissolve the minerals, the original woody tissue was visible under a microscope. As the silica petrified the wood, other elements in the water, such as iron, copper, manganese, and carbon, added tints of red, yellow, orange, brown, blue, green, purple, and black to the fossilized tissues. In some logs, tunnels and galleries are visible, the remains of ancient excavations dug by Triassic insects. 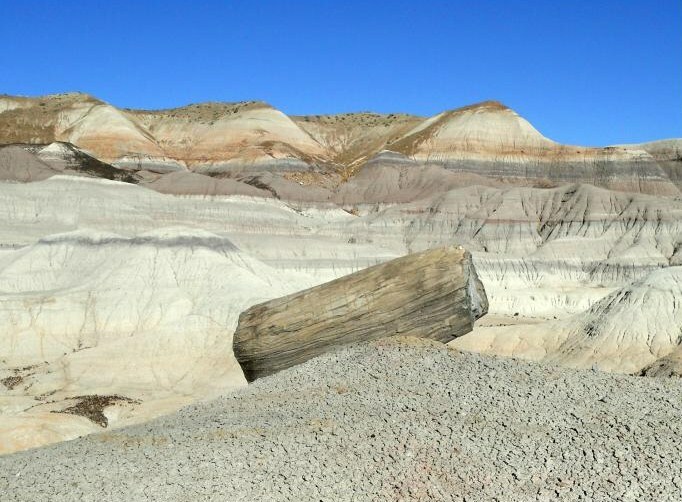 The high degree of preservation of the logs and other fossils in the Chinle Formation is due to favorable conditions, such as warm temperatures, high moisture, and little or no oxygen, during and after deposition of the sediments. This geologic map was a long time in coming. See notes by Bill Parker one of the authors here. Martz, J.W., Parker, W.G., Skinner, L. and Raucci, J.J., Umhoefer,P. and Blakey, R.C., 2012, Geologic Map of Petrified Forest National Park, Arizona. Arizona Geological Survey Contributed Map CR-12-A, 1 map sheet, 1:50,000 map scale, 18 p.
Great article. Do more of stories like this.Tucson Basin, Grand Canyon etc. Much more fun and interesting than the global warming and all of the ensuing and endless comments. Just my view. Check out the ARTICLE INDEX page for many more geology stories.